Camelbaks are a trail's best friend. Summer has finally arrived. I know this because I got my first official sunburn of 2013! The trail running bug has got me now and I'm hoping to hit to the trails sometime soon. We live in town currently, so my runs are on asphalt unless I hit the country gravel roads or some short trails in town. Running is running, so I can't complain either way, but there's something extra awesome about trail running. I loved to run around in our horse and cow pastures as a kid and that really hasn't changed too much, now I just call it trail running! Why is trail running full of awesome-ness? 1. It's hard! 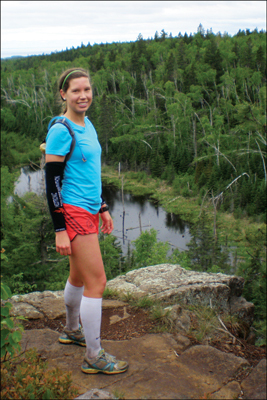 The first marathon I ever ran was a trail marathon (back in 2010) and I had NO clue what I was getting in to. Training for 26.2 miles is enough of a feat and I didn't exactly train properly to run trails for that distance. Fortunately I survived, though the hills and varying terrain definitely took its toll on my by the time I crossed the finish line! 2. PR's are irrelevant. I'm not a trail marathon master, but I've noticed that each trail is so different you can't compare one race to the next. Road races are of no comparison; they are fun in their own way, but not as technical as the trails. 3. Saves on the joints. When training on the trails, my body gets a harder workout but I'm not as sore as I would be from running on the road. The trail surfaces are generally much softer AND your legs get a great stability workout. 4. De-stress time. There is nothing better than spending time out in the woods to de-stress. I may be exhausted after a run on the trails, but I always leave in awe of God's beautiful creation. 4. Random trail encounters. You never know who or what you will run into on the trails! When I've been out on some more desolate trails, I've picked up a stick at times to "save me" from whatever is rustling in the bushes. Fortunately, it's usually deer or some harmless animal... I do NOT look forward to the day I run into a cougar out there! And, yes, one time I found a full deck of Pokemon cards on the trail and took them home with me. It was random and great. 5. Road races seem easier. After training on the varying terrain on the trails, road running seems to take much less effort. I ran my best road racing marathon time three months after running a tough trail marathon. It seemed effortless to run on asphalt instead of climbing up and down muddy, rocky hills! -1. Trails are jogging stroller unfriendly. I won't be taking E out in the jogging stroller on the trails, I guess that would be one downside! We'll save trail running for when he's older and can run alongside me, perhaps. Get out and try some trails this year!